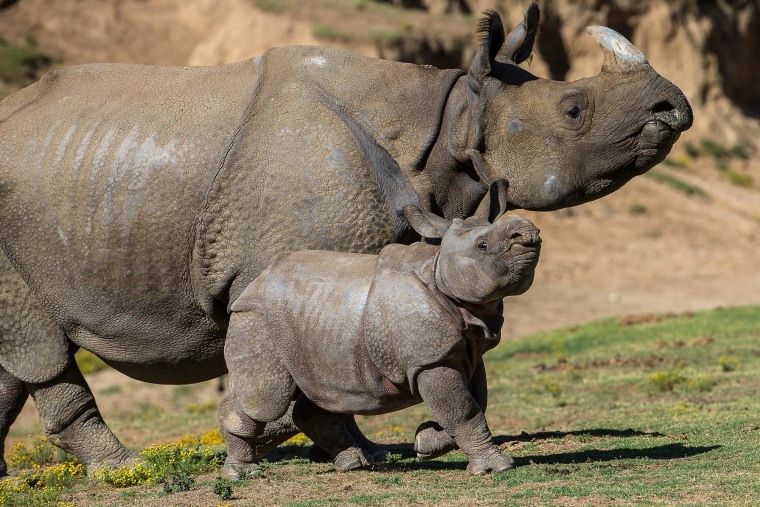 A nine-week-old rhinoceros calf was introduced to the Asian Plains exhibit on Tuesday, joining his mother to meet the rest of their rhino family, the San Diego Zoo Safari Park said in a press release. The male greater one-horned rhinoceros calf, named Parvesh, charged into his new 40-acre habitat at the park and was seen running and stumbling to keep up with his mother, according to the release. The calf and his mother, Alta, were kept in a protected area inaccessible to other animals until today to ensure proper bonding. Parvesh was born on Feb. 25. Alta introduced her new calf to the other rhinoceroses, including his 2 ½-year-old sister. The greater one-horned rhinoceros is listed as an endangered species, and although once widespread in Southeast Asia, the species is now only found in India and Nepal, with an estimated 3,250 remaining in the wild, according to the release.